The Writer/Director of We Are Legion the Story of the Hacktivists is currently at work creating a new documentary about the internet visionary and activist Arron Swartz. Aaron’s powerful story is a poignant chronology of internet history, as well as a story about the cracks in an outdated legal system that lead to such tragic consequences. If funded, the new documentary will also have an original soundtrack by “We Are Legion” composer John Dragonetti. The project is an opportunity to explore the influence one incredibly talented programmer and celebrated internet visionary had on the discussion of information access and what his involvement in such a volatile subject means for all internet users. HELP US MAKE THE FILM! Support the Kickstarter! Since we all love the internet, everyone involved with the film is also a fan of the Internet Archive. Among other things, it is home to the biggest single (and searchable) collection of NASA images, the Open Library, and of course, the Wayback Machine. Join filmmaker Brian Knappenberger, journalists Quinn Norton and Ryan Singel and lawyer Thomas Nolan for a screening of “We Are Legion: the Story of the Hacktivists” on Friday, March 22nd in the “Great Hall.” If you are in the Bay area, come see the film and stay for what promises to be a fascinating night of discussion about Anonymous and internet activism! This weekend, We Are Legion wrapped up its Canadian run, after playing for two weeks in theatres across Toronto, Victoria, Edmonton, and Winnipeg. The documentary was met with positive reviews from the Canadian press, including the Winnipeg Free Press, Canadian Dimension, and O.Canada.com. 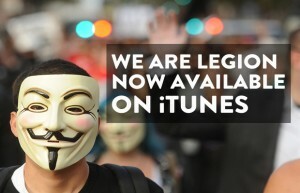 At the same time, We Are Legion played at two special engagements. After a great three-day run at the Seattle International Film Festival this June, the film was brought back for a special engagement at the organization’s beautifully restored theatre SIFF Cinema Uptown, for a weekend engagement. The documentary also played to a large audience in Manchester, at a screening held by Kino Indie Features. Filmmaker Brian Knappenberger was present (via Skype) for a Q&A with the audience, following the UK screening. 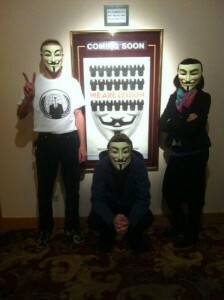 We Are Legion has had its first of three screenings at the International Documentary Film Festival Amsterdam. IDFA, the world’s largest documentary film festival, celebrates its 24th anniversary this year. The prestigious festival averages 120,000 visitors each year. It continues through this weekend, with additional performances of We Are Legion on Thursday and Sunday. For more information, please check out the IDFA website. Films rented through the service can be viewed on nearly any device, including smart phones, tablets, connected TVs, and more. 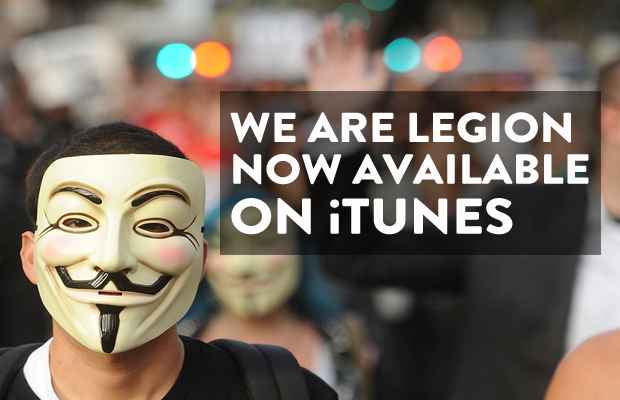 We Are Legion is currently available as a 48 hour rental for $4.99. Screening Dates in Seattle Just Announced! We Are Legion: The Story of the Hacktivists is returning to Seattle for a command performance. After a very successful showing at the Seattle International Film Festival this Summer, the documentary will be returning to SIFF’s Cinema Uptown theatre this weekend. More information on the Friday, Saturday, & Sunday screenings is available here.